R. Baker was recently involved in a large selective demolition project at a petroleum refinery/research center located in northern New Jersey. The project to make way for a new exhaust system and new lab hoods throughout the facility was a complex one, complicated by the facility’s fortress-like construction, with rebar-reinforced, 12-inch-thick floors, walls, ceiling, and roof. Baker crews performed demolition, coring, cutting, rigging, and assembly. Removal of the equipment was the first, and easiest - stage of the project. During this enabling phase R. Baker & Son crew members worked closely with the client to determine which pieces of equipment and fixtures would be removed and when so lab users would have advance knowledge to temporarily work around the missing equipment. When the selective demolition was completed, the more difficult tasks began. Floors were x-rayed to determine to determine where electrical conduit was located. X-rays were performed at night to minimize radiation risks to building occupants. The images required careful study to differentiate between rebar and conduit throughout the floor. Once electrical conduits were identified, they were traced to the nearest electrical panel, and circuits were isolated and rerouted so the floors could be cored. These circular passageways ranged from eight inches to eighteen inches in diameter throughout the facility. 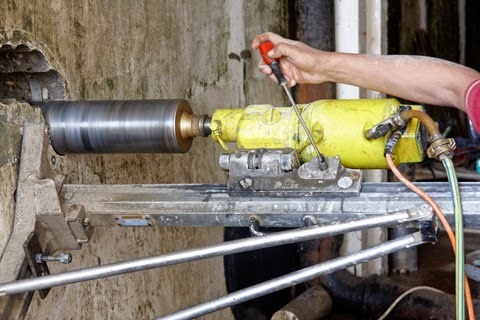 Because the coring machine was water cooled, conduits had to be plugged with clay to prevent water from flowing down into the labs through conduit openings. Some areas could not be cored and had to be jackhammered to expose the conduits and make way for control wiring risers. The entire effort was coordinated with a structural engineer and the HVAC designer. New ductwork, fire dampers, and controls were installed within the openings throughout the building. Large new exhaust fans and plenums were rigged onto the roof, and new lab fume hoods were assembled and installed in all labs. The new lab exhaust system worked in conjunction with the 100% outside air system which provided 105,000 CFM of air throughout the building. Upon completion of the new ventilation system, new pre-fabricated casework was installed where needed for lab experiments.